As the heat of summer solidifies its chokehold over the middle and southern latitudes of North America, grasshopper nymphs will begin to ramp up their development. I see grasshoppers commonly in my soybean field trials, where their feeding presents more of an annoyance to me than an actual threat to yields. I photographed this particular individual on almost this same date last year in one of my Illinois soybean trials, not knowing for sure which species it represented. There was no particular reason for only taking this one single photograph, other than it was perched nicely when I saw it and that I did not feel like taking the time to chase it into another good pose after my first shot disturbed it. Later in the season I saw numerous adults representing Melanoplus differentialis (differential grasshopper), a common species in this area, and assumed this was its nymph. However, a closer look at the photo suggests it represents the closely related M. bivittatus (two-striped grasshopper). While adults of these two species are easily distinguished based on coloration, the nymphs can look very similar (especially in their earlier instars) and are distinguished on the basis of the black femoral marking—more or less solid in M. bivittatus and broken into chevrons that create a “herringbone” pattern in M. differentialis. Wing pad size and relative body proportions suggest this is a fourth-instar nymph. 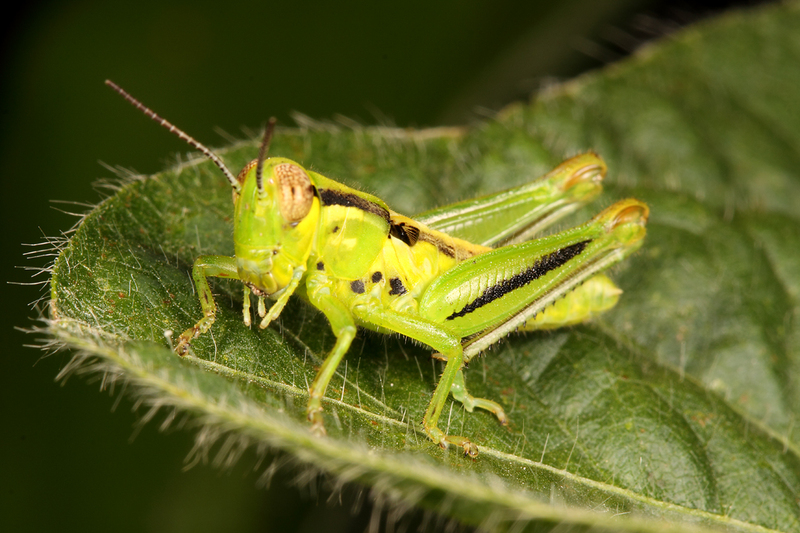 This entry was posted in Acrididae, Orthoptera and tagged entomology, grasshoppers, Illinois, immatures, insects, nature, One-shot Wednesday, science. Bookmark the permalink. They jumped onto my net, and I didn’t dare try to re-locate them for better composition. But yeah, interesting photo!